While Tesla is scoring points by expanding its charging network along the west coast of the United States all the way from Tijuana to Vancouver, it is gaining points in another area as well. See previous post for more information on this topic. 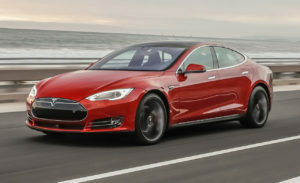 Now Consumer Reports has listed the Tesla Model S as one of the most reliable cars on the road. They gave it a score of 99 points out of 100. It missed out on the one last point due to it needing to be recharged on long trips. Minor problems have been reported for things like squeaks and rattles or locks that did not operate properly. However, when it comes to performance of the car and its battery pack it is off the charts. The range can vary between 208 miles to 265 miles on a full charge depending on the model. Also of course how the car is driven. It takes about 6 hours to recharge on a 240 volt connection. However it can be charged in about one hour at a super charger station. A half a charge takes 20 minutes. A battery can be swapped in 90 seconds for the price of a tank of gasoline for those in a hurry. Tesla is arranging for more and more charging stations to be installed in California. Also across the US along major interstate highways. This will overtime by 2019 allow an electric car to travel across the US in all directions. They will be able to charge at these charging stations. When Will they Come Out with A less Expensive Car? Currently the Model S is sold for prices in excess of $100k which not many people can afford. Tesla is rumored to come out with a SUV version of this vehicle next and then a less expensive car in the future. When they do , this is when it will get really interesting as the mass market begins to pick up on these cars and demand soars. They are currently building a manufacturing plant for car batteries to power electric cars and they are developing an electric vehicle which is rumored to be more affordable for people in the middle class.